Have limited experience and are only beginning to develop the capacity for insight into the link between actions and consequences. Practitioners are advised to be mindful of how demoralising it can be for young people who have formed the view that change is required but not possible. Substance use might be used as a mechanism for coping with these feelings and there is a strong possibility of regression. Further, there is heightened potential that a young person in such circumstances will engage in other ‘risk’ behaviours and may feel suicidal. In the action stage, self-efficacy is expressed through coping with high-risk situations and not regressing to an earlier stage. Youth AOD practitioners should remember that the changes a young person makes on the first attempt may not last. 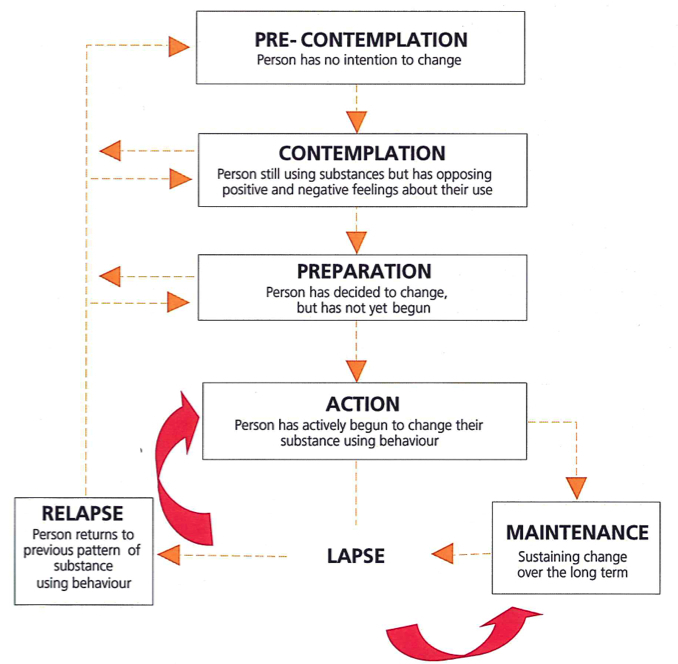 It is far more common for people to make multiple attempts to change substance- using behaviour before finally succeeding (Polivy & Herman, 2002). People can overcome their emotional and physical attachment to substance-using behaviour (Prochaska et al, 1992). This signifies a completion of the change process, also known as ‘exit’. This is typically associated with significant lifestyle change and reflected in the achievement of several significant treatment goals. Even so, for some the attachment to substance-using behaviour is continuous. In such cases, people remain in maintenance.